San Francisco’s Mission Bay district became a melting pot of celebrities, civic dignitaries, community members and assorted creatures of unknown species with dazzling outfits and daring dance moves, as the city marked the upcoming opening of the new UCSF Medical Center. 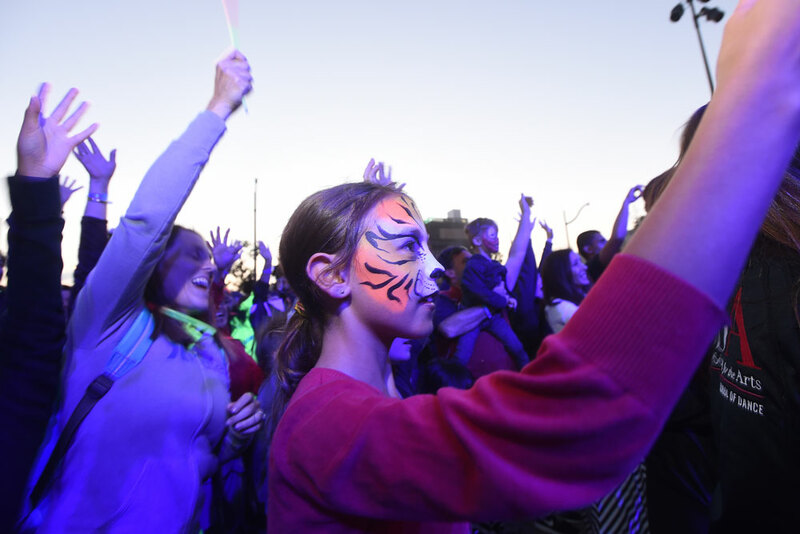 Thousands joined in Saturday’s revelry, starting with the 5K Hard Hat Walk along the waterfront and through the Mission Bay neighborhood and ending with the Lights On Festival in the public plaza outside the medical center complex. The event culminated in a multi-color light show illuminating the windows of the three hospitals opening on Feb. 1, 2015: UCSF Benioff Children’s Hospital San Francisco, UCSF Bakar Cancer Hospital and UCSF Betty Irene Moore Women’s Hospital. Donors and attendees of the celebration raised more than $525,000 for the new hospitals, exceeding the fundraising goal of $500,000. There was plenty of levity to offset the serious moments. A number of teams assembled for the walk dressed in fun costumes. 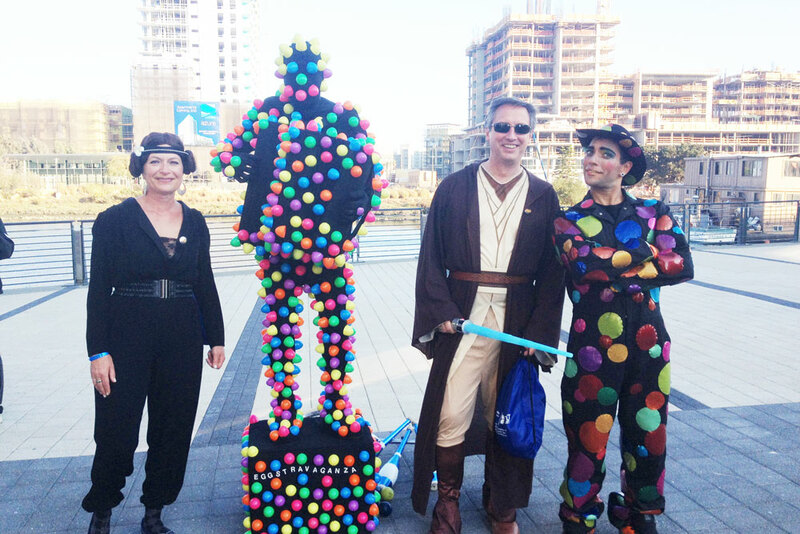 UCSF Chief Information Officer Joe Bengfort nixed the sweats in favor of Luke Skywalker duds to lead his team, the Jedi Masters, which raised close to $12,000. 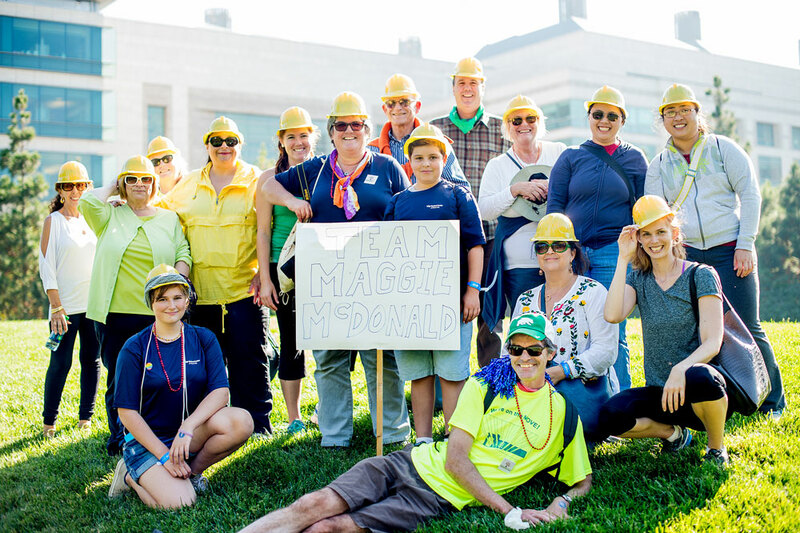 The UCSF Cancer Crusaders donned superhero masks and capes; the Children’s Emergency Department team all wore rainbow tutus; and Remembering Maggie McDonald – one of the top patient fundraising teams – sported yellow hard hats in tribute to 19-year-old Maggie, a longtime patient of UCSF Benioff Children’s Hospital San Francisco who passed away earlier this year. At the festival, families enjoyed pastries, tacos and other tasty treats from top local restaurants, while children got their faces painted, participated in wall art, played bungee run and danced to Vocal Rush, a teen a cappella group from the Oakland School for the Arts. Other participants decompressed with chair messages or a snuggle with a friendly possum from the San Francisco Zoo’s Zoomobile. Adding razzle-dazzle to the event were Jesse Tyler Ferguson, star of the ABC television show “Modern Family,” Olympic champion figure skater Kristi Yamaguchi and San Francisco Giants home run king Barry Bonds, a longtime friend and supporter of UCSF Benioff Children’s Hospital San Francisco (“my brother from another mother,” according to Ferguson). At his invitation, a group of patients joined him on stage. The new hospitals were very personal to him, Franti explained, because his 15-year-old son had been a long-term patient at UCSF Benioff Children’s Hospital San Francisco. The audience nodded in unison, knowing the hospitals will play a key role in their health and that of their loved ones for generations to come.